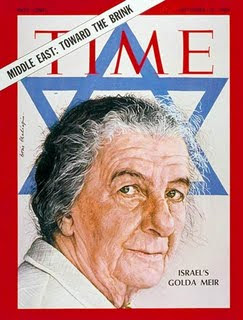 Trips to Israel have given me the impression that that Golda Meir is a bigger hero in the United States than in Israel. The reason is probably that in the 59 years since the War of Independence, the Yom Kippur War was the closest the Jewish State ever came to being destroyed. One version of history suggests that Meir had pretty strong intelligence that it was about to be attacked, but instead of launching a preemptive attack like in 1967, she heeded US Secretary of State Henry Kissenger's warning not to attack first. Many Israelis, including my friend Avi who was a tank commander in the Sinai, put the blame for Israel's near defeat during the first few days of the Yom Kippur war squarely on the shoulders of Ms Meir. My friend Chaim, who also served in that war, disagrees, he says that what today's Israel's leadership lacks today is a pair of brass "family jewels" like Golda had. One day I would like to have my two friends in a room and hear them talk it out. But one thing the two would agree with is Golda did take a strong stance against terrorism. She was a strong advocate of not appeasing terrorists. If her advice was heeded, today's war against the terrorist tactics of fascist Islamism may not exist. How does one treat terrorists? Deal with them and you're done for; don't and innocents die. Take the case of Schoenau. It is a tale of infamy that seized the assemblage of the Council of Europe in September 1973. The Council of Europe in Strasbourg is that continent's approximation to a representative house. At the time in question, its 400-odd delegates watched with various degrees of curiosity as a stooped, aging woman with a face deeply scarred with tragic lines mounted the podium. She was prime minister Golda Meir, and she was there at the invitation of the European Council to state the case for Israel. Finally, a coherent theme emerged and a speech surfaced. It thanked the council and individual European parliaments for raising their voices in support of Soviet Jewry's right to freely emigrate to Israel (this was at the height of the worldwide "Let My People Go" campaign), delved into the intricacies of the Middle East conflict, pleaded for "the European Council's help to enable the Middle East to emulate the model of peaceful coexistence that the council itself had established," and perorated with a quote from the great European statesman Jean Monnet, that "peace depends not only on treaties and promises. It depends essentially upon the creation of conditions which, if they do not change the nature of men, at least guide their behavior towards each other in a peaceful direction." To my consternation Golda never enunciated a single one of these words. Instead, she scanned the assembly from end to end, jaw jutting, her expression defiant, and after combing back her hair with the fingers of both hands, brandished the written speech, and in a caustic tone said, "I have here my prepared address, a copy of which I believe you have before you. But I have decided at the last minute not to place between you and me the paper on which my speech is written. Instead, you will forgive me if I break with protocol and speak in an impromptu fashion. I say this in light of what has occurred in Austria during the last few days." CLEARLY, THE woman had decided it was idiotic to read her formal address after the devastating news which had reached her just before leaving Israel for Strasbourg: A train carrying Jews from communist Russia en route to Israel via Vienna was hijacked by two Arab terrorists at a railway crossing on the Austrian frontier. Seven Jews were taken hostage, among them a 73-year-old man, an ailing woman and a three-year-old child. The terrorists issued an ultimatum that unless the Austrian government instantly closed down Schoenau, the Jewish Agency's layover near Vienna where the émigrés were processed before being flown on to Israel, not only would the hostages be killed, but Austria itself would become the target of violent retaliation. The entire Arab world could hardly contain its glee, and a fuming Golda Meir instructed her aides to arrange for an early flight from Strasbourg to Vienna where she intended to confront her fellow prime minister, her fellow socialist and her fellow Jew, Bruno Kreisky, herself. To the European Council she said, "Since the Arab terrorists have failed in their ghastly efforts to wreak havoc in Israel, they have of late taken their atrocities against Israeli and Jewish targets into Europe, aided and abetted by Arab governments." This remark caused a fidgety buzz to drone around the packed chamber, and it seemed to deepen when she spoke bitterly about the 11 Israeli athletes kidnapped and murdered at the Munich Olympics the summer before, an outrage compounded by the German government's subsequent release of the surviving killers in return for the freeing of a hijacked Lufthansa plane and its passengers. "Oh yes, I fully understand your feelings," said Golda cynically, arms folded as tight as a drawbridge. "I fully understand the feelings of a European prime minister saying, 'For God's sake, leave us out of this! Fight your own wars on your own turf. What do your enmities have to do with us? Leave us be!' And I can even understand" - this in a voice that had gone grimmer than ever - "why some governments might even decide that the only way to rid themselves of this insidious threat is to declare their countries out of bounds, if not to Jews generally then certainly to Israeli Jews, or Jews en route to Israel. It seems to me this is the moral choice which every European government has to make these days." And then, chopping the air with balled fists, her face as granite as her eyes, she thundered, "European governments have no alternative but to decide what they are going to do. To every one which upholds the rule of law I suggest there is but only one answer - no deals with terrorists, no truck with terrorism. Any government which strikes a deal with these killers does so at its own peril. What happened in Vienna is that a democratic government, a European government, came to an agreement with terrorists. In so doing it has brought shame upon itself. In so doing it has breached a basic principle of the rule of law, the basic principle of the freedom of the movement of peoples - or should I just say the basic freedom of the movement of Jews fleeing Russia? Oh, what a victory for terrorism this is!" THE ENSUING applause told Golda Meir that she had gotten her message across to a goodly portion of the European Council, so off she flew to Vienna. Ushered into the presence of the impeccably dressed, bespectacled, heavy-set man in his mid-60s whom she knew to be the son of a Viennese Jewish clothing manufacturer, she extended her hand, which he shook while rising with the merest sketch of a bow, but not budging from behind the solid protection of his desk. "Please take a seat, Prime Minister Meir," he said formally. "Thank you Chancellor Kreisky," said Golda, settling into the chair opposite him, and placing her copious black leather handbag on the floor. "I presume you know why I am here." "I believe I do," answered Kreisky, whose body language bore all the signs of one who was not relishing this appointment. "You and I have known each other for a long time," said Golda softly. "We have," said the chancellor. "And I know that, as a Jew, you have never displayed any interest in the Jewish state. Is that not correct?" "That is correct. I have never made any secret of my belief that Zionism is not the solution to whatever problems the Jewish people might face." "Which is all the more reason why we are grateful to your government for all that it has done to enable thousands of Jews to transit through Austria from the Soviet Union via Schoenau to Israel," said Golda diplomatically. "But the Schoenau transit camp has been a problem to us for some time," said Kreisky stonily. "What sort of a problem?" "For a start, it has always been an obvious terrorist target..."
Golda cut him off, and with a strong suggestion of reproach, said, "Mr. Kreisky, if you close down Schoenau, it will never end. Wherever Jews assemble in Europe for transit to Israel, they will be held to ransom by the terrorists." "But why should Austria have to carry this burden alone?" countered Kreisky with bite. "Why not others?" "Such as the Dutch. Fly the immigrants to Holland. After all, the Dutch represent you in Russia." It was true. Ever since the Russians had broken off diplomatic relations during the 1967 Six Day War, the Dutch Embassy in Moscow represented Israel's interests there. "Oh, I'm sure the Dutch would be prepared to share the burden if they could," responded Golda, trying to sound even-tempered. "But they can't. It doesn't depend on them. It depends entirely on the Russians. And the Russians have made it clear that they will not allow the Jews to fly out of Moscow. If they could we would fly them directly to Israel. The only way they can leave is by train, and the only country they will allow Jews to transit through is yours." "So let them be picked up by your own people immediately upon arrival in Vienna, and flown straight to Israel," argued the chancellor, holding his own. "That's not practicable. You know and I know that it takes guts for a Jew to even apply for an exit permit to leave Russia to come to us. They lose their jobs, they lose their citizenship and they are kept waiting for years. And once a permit is granted, most are given hardly more than a week's notice to pack up, say their good-byes and leave. They come out to freedom in dribs and drabs, and we never know how many there are on any given train arriving in Vienna. So we need a collecting point, a transit camp. We need Schoenau." THE CHANCELLOR settled his elbows on the desk, steepled his fingers, looked the woman directly in the eye, and said sanctimoniously, "Mrs. Meir, it is Austria's humanitarian duty to aid refugees from whatever country they come, but not when it puts Austria at risk. I shall never be responsible for any bloodshed on the soil of Austria." "And is it also not a humanitarian duty not to succumb to terrorist blackmail, Herr Chancellor?" Her words, sudden and raw and angry, were a declaration of war. What had begun as conflicting views between opponents was now a nasty cut-and-thrust duel between antagonists. Kreisky shot back: "Austria is a small country, and unlike major powers, small countries have few options in dealing with the blackmail of terrorists." "I disagree," seethed Golda. "There can be no deals with terrorism whatever the circumstances. What you have done is certain to encourage more hostage taking. You have betrayed the Jewish émigrés." The man's brows drew together in an affronted frown. "I cannot accept such language, Mrs. Meir. I cannot..."
"You have opened the door to terrorism, Herr Chancellor," the prime minister spat undeterred. "You have brought renewed shame on Austria. I've just come from the Council of Europe. They condemn your act almost to a man. Only the Arab world proclaims you their hero." "Well, there is nothing I can do about that," said the Austrian in an expressionless voice, looking uncomfortably still. And then, with a hint of a shrug, "You and I belong to two different worlds." "Indeed we do, Herr Kreisky," said Golda Meir in a voice cracked with sardonic Jewish weariness. "You and I belong to two very, very different worlds." And she rose, picked up her handbag, and made for the door. As she did so an aide to the chancellor entered to say the press was gathered in an adjacent room awaiting a joint press conference. Golda shook her head. She asked herself, what was the point? Nothing she could say to the media could make any difference. Kreisky wanted to keep in the good books of the Arabs - it was as simple as that. So, she turned and hissed in Hebrew to her aides, "I have no intention of sharing a platform with that man. He can tell them what he wants. I'm going to the airport." To him she said contemptuously, "I shall forgo the pleasure of a press conference. I have nothing to say to them. 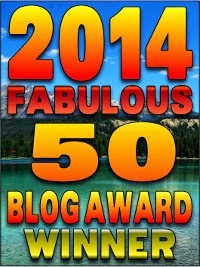 I'm going home," and she exited through a back stairway. FIVE HOURS later she told the waiting Israeli press at Ben-Gurion Airport, "I think the best way of summing up in a nutshell the nature of my meeting with Chancellor Kreisky is to say this: He didn't even offer me a glass of water." Postscript: Schoenau was shut down, but Golda Meir's remonstrations triggered such an international whirl of protest that the Austrian chancellor had no choice but to offer alternative arrangements. One day a few years later, after Menachem Begin assumed the premiership (1977), I was about to walk into the room of his bureau chief, Yehiel Kadishai, when a bedraggled-looking fellow in a battered trilby hat and a tattered raincoat, whom I recognized as a peddler of matches in downtown Jerusalem, walked out. "What's that hawker doing here?" I asked. "Do you know him?" "Sure." said Yehiel, his face deadpan. "His name is Kreisky." "Shaul Kreisky, brother of the chancellor of Austria, Bruno Kreisky." My mouth dropped open. "You're pulling my leg," I said. "No I'm not. He's been living here for years. The prime minister occasionally helps him out. He's a great fan of Begin. Run after him and ask him." I did. It was true.